Haim Sisters Sit Front Row at Stella McCartney Paris Fashion Show! The ladies of HAIM strike a fierce pose together while attending the Stella McCartney show as part of the Paris Fashion Week Womenswear Spring/Summer 2019 on Monday (October 1) in Paris, France. The sister-trio – Este, 32, Danielle, 29, and Alana Haim, 26 – were joined at the event by Poppy Delevingne, Isabelle Huppert, Zara Larsson, Alexandra Richards and Alexa Chung as they all sat in the front row of the presentation. 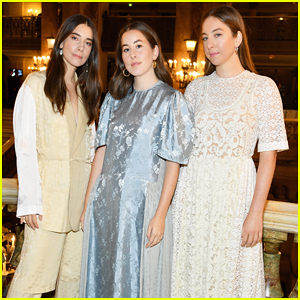 Haim have been making their rounds at the fashion shows all week. Anne Hathaway & Adam Shulman Couple Up at Star-Studded Givenchy Paris Show! Anne Hathaway happily strikes a pose alongside her hubby Adam Shulman while attending the Givenchy show as part of the Paris Fashion Week Womenswear Spring/Summer 2019 on Sunday (September 30) in Paris, France. The happy couple were joined at the event by Rooney Mara, Aaron Taylor-Johnson and his wife Sam Taylor-Johnson, Amanda Seyfried, Liv Tyler, Isabelle Huppert, Karen Elson and Dree Hemingway as they all sat in the front row of the presentation. Also in attendance was Haim – aka sisters Este, 32, Danielle, 29, and Alana Haim, 26. Earlier in the month, Anne was honored with the HRC National Ally For Equality Award at the 2018 HRC National Dinner. FYI: Amanda is wearing Octavia Elizabeth earrings. Marion Cotillard walks the carpet while attending Jean Paul Gaultier’s Fashion Freak Show during Paris Fashion Week on Friday (September 28) in Paris, France. The Oscar-winning actress was joined at the event by fellow actress Isabelle Huppert, as well as models Coco Rocha, Lais Ribeiro, Isabeli Fontana, and Andreja Pejic. The stage production is a mix between a fashion show and a musical revue and the show opens to the public on October 2. Chloe Moretz and Isabelle Huppert look so stylish on the red carpet at the premiere of their new movie Greta on Thursday night (September 6) at the Ryerson Theatre in Toronto, Canada. The 21-year-old actress looked pretty in a pink velvet dress while the 67-year-old French actress went chic in a printed suit for premiere held during the 2018 Toronto International Film Festival. Maika Monroe also attended the premiere. After the premiere, the actresses stepped out for their film’s after party. No word yet when Greta will hit theaters. FYI: Chloe‘s premiere dress is by Erdem. Isabelle is wearing a Chloe suit. Maika is wearing a Khaite dress. Anya Taylor-Joy and Elizabeth Debicki pose for photos while attending the Giorgio Armani Prive Haute Couture show held during Paris Fashion Week on Tuesday (July 3) in Paris, France. Some other stars in attendance included Isabelle Huppert, Juliette Binoche, Kristin Scott Thomas, Melanie Thierry, and Cressida Bonas. Tina Turner was also at the show. Anya will be heading to San Diego Comic-Con later this month to promote her upcoming movie Glass, which is the sequel to last year’s hit horror thriller Split. We hope that the trailer will be released at the panel! Emma Stone, Sienna Miller and Justin Theroux are sharing their passion for fashion! The three stars were all in attendance at the Louis Vuitton 2019 Cruise Collection Show at Fondation Maeght on Monday (May 28) in Saint-Paul-De-Vence, France. Mark Ronson, Lea Seydoux, Laura Harrier, Sophie Turner, Isabelle Huppert, Doona Bae, Jennifer Connelly, Sehun of EXO and Luka Sabbat also attended the show. The legendary French label, helmed by creative director Nicolas Ghesquiere, unveiled its latest collection on the French Riviera. You can watch a stream of the show below!